Bosbury is a village and civil parish in Herefordshire, England. It is about five miles north of Ledbury. According to the 2001 census it had a population of 780. The church, dedicated to The Holy Trinity, stands in the centre of the village and is of Norman foundation with some fine later medieval additions. The tower is notable for being one of seven in Herefordshire standing quite apart from the church, some considerable distance in Bosbury’s case. This was for defensive purposes in the troubled border marches. 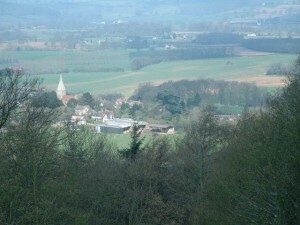 The village was most noted in the 19th and 20th centuries for hops, being the largest hop farming area outside of Kent. The local hop industry in the area is much reduced and many old hop yards stand empty or have been demolished. The medieval bishops of Hereford had a palace at Bosbury (supporting the village’s proud boast that in pre-Conquest times it was a larger community than the City of Hereford), and frequently held court there. The palace remains are on the site of Old Court Farm behind the church. The Knights Templar had a base in Bosbury at what is now Prior’s Court Farm, and there is a Templar grave stone inside the church. The most notable dwelling, Bosbury House, is a substantial Georgian red brick building just outside the village. Bosbury is also noted for its many black and white dwellings, some in the village, and several scattered throughout the parish in the ancient farms. The Victorian novelist, Edna Lyall, is buried and commemorated in the churchyard. Inside the church sanctuary, one on each of the north and south walls, are two fine examples of Renaissance Italian tombs, dedicated to members of the Harford family who lived in Bosbury throughout the 16th century. For lots more information on the history of Bosbury, please head to the Bosbury History Resource website. 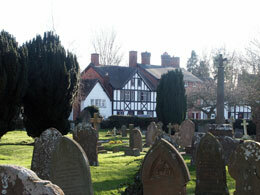 Coddington is a beautiful hamlet lying east of Bosbury and about 3.5 miles north of Ledbury. It is situated in a very picturesque spot below the Malvern Hills. Coddington was the birthplace of Lionel George Curtis, a prominent advocate of world government. Curtis was a British official and author. He advocated ‘British Empire Federalism’ and, late in life, a world state. His ideas concerning dyarchy were important in the development of the Government of India Act 1919 and more generally, his writings influenced the evolution of the Commonwealth of Nations. Coddington was also home to one of the few independent British oil companies, established in the 1970s by a group of ex-Royal Dutch Shell employees – Clyde Petroleum. Coddington boasts a superb vineyard that produces award-winning wines from the Bacchus, Ortega and Pinot Gris grapes. For those who are more interested in the spiritual, Coddington Court is home to Adhistana, a Buddhist centre and is part of the The Triratna Community within Buddhism. They run courses and retreats all year round.